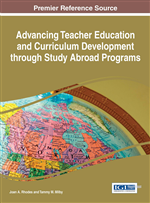 The authors describe a faculty led study abroad program implemented in Puerto Rico. The short-term study abroad model highlights both design and implementation strategies for travel abroad. This chapter also focuses on the unique cultural and linguistic experiences in Puerto Rico which were planned for college students in an early childhood education teacher preparation program. The chapter addresses the strategies used to facilitate learning about Puerto Rican culture and languages, methods to support students learning dual languages and strategies for working with families, communities, and other professionals. The chapter concludes with lessons learned from this experience and emphasizes both issues and recommendations for faculty who are developing future short-term travel experiences. Teacher preparation programs in the United States aim to prepare future teachers to work effectively with all students, including those whose first language is not English. Early childhood education programs attain this goal by meeting the teaching standards that focus on the learner and learning, content knowledge, appropriate pedagogical practices, and relationships with families and communities (Interstate New Teachers Assessment and Support Consortium [InTASC], 2011; National Association for the Education of Young Children [NAEYC], 2011). The course, Dual Language Learners in Early Childhood Settings, supports many of the NAEYC standards, but particularly, NAEYC Standard 1: Promoting Child Development and Learning; Standard 2: Building Families and Community Relationships; and Standard 4: Using Developmentally Appropriate Approaches. These standards assist in assuring that candidates in teacher preparation programs know and understand learners, diverse families, and effective strategies and tools for early education (NAEYC, 2011). The Dual Language Learners in Early Childhood Settings course is regularly offered to undergraduate students on campus. The course addresses issues of culture, language, and pedagogical practices in early care and education programs. The course also compares the language development of dual language children versus monolingual children, and the impact that language development has in educational settings. In this course, students explore instructional strategies to support the language and academic performance of dual language learners in early childhood classrooms for children ages birth to eight years old and their families. The course also explores strategies on how to work in collaboration with families, communities, and other professionals such as English for Speakers of Other Languages (ESOL) specialists. These strategies serve as a vital resource for preservice teachers who are learning about the cultural continuity needed in the classroom to build successful interactions with children of diverse backgrounds. All of these areas are stressed in this course to assist students’ understanding of dual language learners and their ability to become culturally responsive teachers in the future.